This Week’s No. 98 Curb Records Ford F-150… The No. 98 ThorSport Racing team will unload chassis No. 55 for Thursday night’s NASCAR Camping World Truck Series (NCWTS) Buckle Up In Your Truck 225 at Kentucky Speedway. This particular chassis made five starts in 2017 with Grant Enfinger behind the wheel, but was rebuilt for the 2018 season, and will make its debut Friday night under the lights. Bluegrass State Stats… Enfinger has two NCWTS starts to his credit at Kentucky Speedway (2016 and 2017), finishing 12th and 28th, respectively. Furthermore, the ThorSport Racing driver has five starts in the ARCA Racing Series presented by Menards at the 1.5-mile track. His success includes 35 laps led en route to three top-five finishes. Intermediate Track Facts… In seven starts on an intermediate-size (1.5-mile) track this season, Enfinger has led 47 laps en route to two top-five, and five top-10 finishes. Race Rewind – Chicago… Enfinger started the Overton’s 225 at Chicagoland Speedway 13th, finished 14th in Stage 1 and 10th in Stage 2. 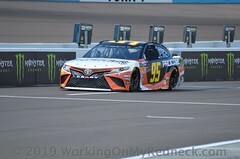 The ThorSport Racing driver was able to bring home a top-10 finish, finishing eighth, despite damage to the left front nose late in the 150-lap event. 2018 Stats… In 11 starts this season, Enfinger has one pole (Gateway), and has led 49 laps en route to three top-five, and seven top-10 finishes. 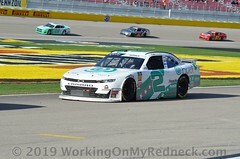 The ThorSport Racing driver has a season-best start of third (Martinsville), and three season-best finishes of fourth (Las Vegas Motor Speedway, Martinsville Speedway and Texas Motor Speedway). 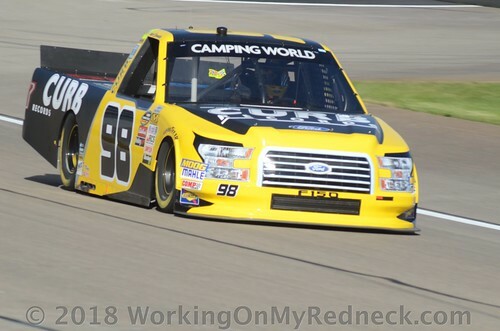 Truck Series Stats… Enfinger has 48 career NCWTS starts to his credit. His success includes 140 laps led en route to one pole (Daytona, 2016), one win (Talladega, 2016), 14 top-five and 27 top-10 finishes. Catch Grant at Kentucky… Enfinger will join his fellow ThorSport Racing teammate, Matt Crafton, at the Ford Stage in the midway at Kentucky Speedway, Thursday, July 12, at 3 p.m. ET. About Curb Records… Celebrating over 50 years in the entertainment business, Curb Records is one of the world’s leading independent music companies. Owned and operated under The Curb Group by Mike Curb since 1962, Curb Records has achieved 433 number one records, over 1,500 hundred Top Ten records and charted over 4,500 total records. Today’s roster includes some of the top names in Country, Christian and Pop/Rock music. Curb Records has produced over 100 Billboard awards and achievements and was recently honored as the 2015 Mediabase Gold Label of The Year. For more information visit: Curb.com.